Don’t judge me: I caught bits and pieces of Dancing With The Stars while my wife was watching, and they dedicated the show to Michael Jackson’s album, Bad. Honestly, I was surprised – I didn’t think that was a very good album (except for Smooth Criminal). I wondered, was Bad really a good album, and I just remembered it incorrectly? To sell 8 M copies of an album is great. But it’s not that great if you’re Michael Jackson. Which albums sold more copies than Bad? The list is numerous – over 100, and includes such winners as Nelly’s Country Grammar, Will Smith’s Big Willie Style, MC Hammer, Jewel, N’Sync, and the list goes on and on. 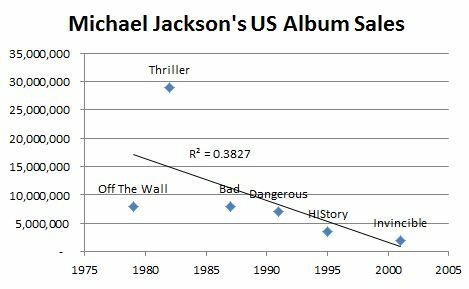 Bad actually sold 70% fewer copies than Thriller. And the trajectory after Thriller was steeply downward.